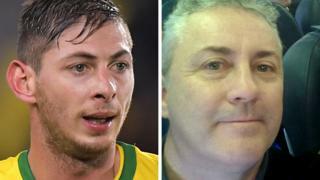 A crowd funded search has found "no trace" of the pilot of the plane which crashed with Cardiff City striker Emiliano Sala on board. David Ibbotson was flying the footballer to the UK when their Piper Malibu aircraft crashed near Guernsey on 21 January. A helicopter was used to search remote coastal areas and two divers went down to the aircraft wreckage. Organiser David Mearns said that the "active search" had ended. "Sadly there was absolutely no trace of David, no trace of any clothing, no trace of any of his personal items," said Mr Mearns. He added: "In terms of the active search, it ended today. But that doesn't mean there isn't a chance that that David's body will still wash ashore." The hunt for Mr Ibbotson, of Crowle, North Lincolnshire, is being funded via an online campaign launched by his family. The appeal launched by Mr Ibbotson's family has raised nearly £250,000. It was boosted with contributions from French footballer Kylian Mbappe, who donated £27,000, and former England captain Gary Lineker who gave £1,000. On the page, his sister Danielle Ibbotson wrote: "We can not bear the thought of him being alone, we need him home so that we are able to lay him to rest to be able to say goodbye."